Hanover, New Hampshire (July 7, 2014) -- 110 years ago, Asakawa Kan’ichi, Dartmouth College Class of 1899 and Dartmouth lecturer 1902-07, published several essays in the Yale Review (where he had earned his PhD in History in 1902) on the Russo-Japanese War: Its Causes and Issues. The Russo-Japanese War, which raged from 1904 until the signing of the Portsmouth Peace Treaty, in Portsmouth NH, on September 5, 1905 is now recognized by historians as "World War Zero" for its modern weapons, huge casualties and the conflicting interests of international governments. The Portsmouth Peace Treaty was a moment in Japanese international history that marked the emergence of Japan as a global player. The Treaty, signed in Portsmouth on September 5,1905 won President Theodore Roosevelt the Nobel Peace Prize -- even though he never came to Portsmouth. September 5th is now, by state law, Portsmouth Peace Treaty Day throughout New Hampshire. Asakawa was from the town of Nihonmatsu in Fukushima Prefecture (coincidentally where the great earthquake and tsunami of 2012 was centered). Nihonmatsu and Hanover have been Sister Cities since the early 1990s. A group of junior high students and chaperones from Fukushima visit Hanover every summer, and Nihonmatsu reciprocates by hosting Dartmouth students in the summer language program in Japan for a weekend homestay. On Saturday, July 26 at 2 pm at The Hanover Inn (2 East Wheelock Street), the Town of Hanover, Dartmouth and the Japan-America Society welcome 10 students and the Mayor of Nihonmatsu with a program by the Japan Society president and founder of the Portsmouth Peace Treaty Forum, Atty Chales Doleac. 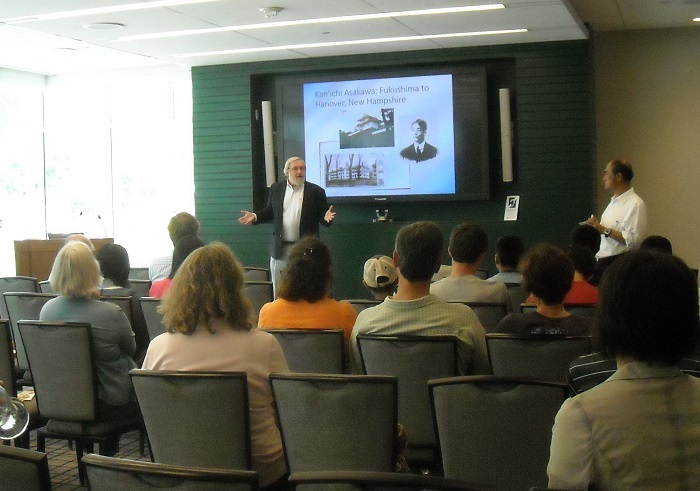 He presents his NH Humanities Council talk -- "Teddy Roosevelt's Nobel Peace Prize & the Portsmouth Peace Treaty" -- with additional historical details on Asakawa and the Dartmouth connection. The talk is free and open to the public. Refreshments served.